As the consequences of climate change come into sharper focus, geo-engineers seek safe, reversible ways to halt it, such as stabilizing the Arctic ice cap. There’s little to associate global warming with Utqiagvik (formerly Barrow), Alaska, a remote North Slope hub with roughly 4,600 residents and unpaved, permafrost streets. Yet this northernmost U.S. outpost, which lies 360 miles inside the Arctic Circle, draws researchers from around the world. Their mission: Study and protect the planet from the ravages of climate change. Leslie Field, an engineer, inventor, and consulting professor in electrical engineering at Stanford University, is among the visitors field-testing potential interventions. Back in May 2017, she and her team set out on snowmobiles “into what seemed like an endless sunrise with an ice rainbow around it.” Arriving at a shallow lake where the Beaufort and Chukchi seas meet, they attached an agricultural seed-spreader to one of the vehicles and proceeded to cover 188,000 square feet with millions of microscopic glass bubbles. Last year, they repeated the experiment, but with a variation of the chemically inert silica sand. “My solution is to try to be as gentle as possible,” Field told a Stanford seminar on her work at Ice911, the nonprofit she founded in 2006 to develop nontoxic, reversible ways to “reboot” melting Arctic ice by increasing its reflectivity. If Field was on a lonely mission to Point Barrow when Ice911 first launched its radical response to global warming, she now has company. 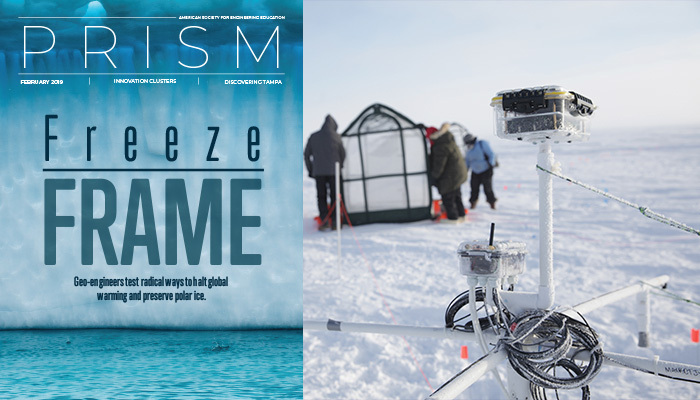 While her team experiments with Arctic-centered techniques to reflect sunlight back into space before it can warm Earth, researchers at Harvard University’s Solar Geo-engineering Research Program are exploring the feasibility, impact, and policy implications of achieving the same result by shooting aerosols into the stratosphere from an aircraft. The National Academies recently formed a committee to come up with a research agenda and governance approaches for solar geo-engineering strategies. “We are running out of time to mitigate catastrophic climate change,” Marcia McNutt, president of the National Academy of Sciences, said in announcing the study. The effort will build on one of a pair of 2015 reports on climate intervention. The committee that produced them concluded that while removing carbon dioxide from the atmosphere showed promise, technologies to reflect incoming sunlight posed considerable risk. By the end of this century, if current trends continue, carbon dioxide and other heat-trapping emissions will boost global temperatures by up to 5⁰ Celsius and sea levels by as much as 1 meter, according to the Intergovernmental Panel on Climate Change. One sign this forecast is on track: Perennial Arctic sea ice has diminished at a rate of 13 percent per decade, far exceeding predictions. Scientists also have warned about an increase in the frequency and severity of droughts, heat waves, and extreme storms as the climate changes. To stabilize carbon dioxide in the atmosphere, the National Research Council calculated in a 2011 report that emissions needed to drop by 80 percent. Instead, emissions continue to increase, driven by fossil-fuel combustion in cars, power plants, and industry. Even if an aggressive global program could be mounted—and most countries have fallen short of the goals enshrined in the Paris Agreement pledging to limit greenhouse gas production—it would take decades to mitigate or reverse the consequences of what’s already released. Some geo-engineering techniques seek to remove carbon dioxide from the atmosphere. In 2016, for example, Iceland’s CarbFix project dissolved CO₂ in water and injected it into the ground, where it reacted with volcanic basalt to form carbonate minerals in less than two years, a far shorter time than the centuries or millennia that some researchers had suggested the process would require. In 2017, Zurich-based start-up Climeworks teamed up with CarbFix researchers to open the first “negative emissions” plant in Iceland to see if large-scale conversion of atmospheric carbon dioxide to stone was feasible. Other projects, such as the Big Sky Carbon Sequestration Partnership based at Montana State University, have used similar techniques with successful results. Harvard geo-engineer David Keith, who founded the Calgary-based start-up Carbon Engineering, doubts whether such methods are practical. In 2018, he calculated that it cost his direct-air-capture demonstration plant about $94 to $232 over the course of three years to sequester each ton of CO₂ from the atmosphere. While that was far less than the $600 or more required in 2011 and prices should come down as the technology improves, most researchers—including Keith—argue that it is cheaper and smarter to simply limit emissions. Given the cost of carbon removal and the world’s seeming inability to slash emissions by the amount necessary, what about modifying the effects of greenhouse gases? That’s the question drawing attention and investment to strategies like Field’s, which target the sun’s ability to warm the oceans and, by extension, the planet. Field would do this by redirecting sunlight back to space by increasing the reflective power, known as albedo, of the polar ice cap. In so doing, she would preserve, and in time restore, the rapidly melting ice pack, which reflects between 30 percent and 80 percent of the sun’s rays. “The Arctic right now is an incredibly important lever on climate change, and the single safest lever that we can do something about quickly,” says Field. Her decade-long quest to find materials than can mimic the reflectivity of Arctic ice without harming wildlife gained new urgency in December with the National Oceanic and Atmospheric Administration’s “most recent dire report” at the American Geophysical Union announcing that 95 percent of the Arctic’s multiyear Arctic ice is gone. Field, who holds 54 patents, earned a B.S. and a master’s degree in chemical engineering from MIT and joined Chevron as a research-and-development engineer, helping get lead out of gasoline. Pivoting professions, she earned an M.S. and a Ph.D. in electrical engineering from UC–Berkeley, became a project leader at Hewlett Packard, and then turned to consulting on nanotechnology and microelectromechanical systems. She also lectured at Stanford. In 2006, she saw An Inconvenient Truth, former Vice President Al Gore’s documentary on climate change. “I realized that this was going to be a huge problem in my kids’ lifetime, so I put ‘habitable planet’ on my to-do list,” she recalls. Fog is only partly water, however. Seitz wants to generate a hydrosol that is mostly water. “A hydrosol is basically a cloud turned inside out,” he says. “It only takes a part-per-million air to raise the surface albedo of the water column from 6 to 14 percent; when you go to seven parts per million, which is still a preposterously small amount of air, your reflectivity goes to 20 percent.” Because air is free and bubbles require mere kilowatts per square kilometer to make, his approach would be inexpensive. Seitz says arrays could be deployed on ships to generate bright, bubbly wakes many kilometers long, or put in reservoirs, where they also could reduce evaporation and save tons of water annually. The challenge, says Seitz, “is making bubbles last long enough to do anything.” In ponds full of dissolved organic matter, microbubbles can last up to three minutes, he notes. And during cyclone season, when storms pulverize sea urchins and other sea life on the Great Barrier Reef, the next day’s foamy high tide in Brisbane or Adelaide often “looks like soap suds that can last hours.” Seitz has received funding to explore his concept from former U.S. Environmental Protection Agency assistant administrator William Nitze, chairman of Oceana Energy Company, which seeks to convert tidal energy into electricity. “My hope is that the clever people who increase the shelf life of ice cream in the freezer by adding bubbles to it can apply that kind of design to increasing bubble lifetime in the water,” he says. The 2001 eruption of Mount Pinatubo in the Philippines spewed about 15 million tons of sulfates into the stratosphere, resulting in a haze that cooled the globe by roughly 1⁰ Fahrenheit over 15 months until it dissipated. One of geo-engineering’s most ambitious—and most controversial—proposals seeks to mimic that effect by spraying vast amounts of reflective particles into the atmosphere 10 kilometers to 50 kilometers above Earth. Harvard researchers plan to launch the first stratospheric aerosol tests sometime this year. The Stratospheric Controlled Perturbation Experiment (SCoPEx) will deploy steerable balloons that release plumes of aerosols, starting with ice, about 20 kilometers above Earth to see how the materials behave. Gernot Wagner, executive director of Harvard’s solar geo-engineering research program, and his colleague Wake Smith at Yale University are working out the flight details. They calculate that a Stratospheric Aerosol Injection Lofter (SAIL) with disproportionately large wings and a relatively stubby, narrow fuselage could carry 25 tons to an altitude of about 20 kilometers. A fleet of 95 SAILs could perform more than 60,000 flights, delivering enough aerosols to cut average projected temperature increases in half. The potential impact on the environment has raised concerns even among albedo-modification researchers. Seitz, for example, worries that dimming the sun would affect photosynthesis and thus plants and crops. Others warn that stratospheric aerosol injection might damage the ozone layer or have unpredictable effects on climate globally. Engineers like Concordia’s Akbari seek solutions closer to home. More than 60 percent of urban surfaces are covered by roofs or pavements, which are dark and typically absorb more than 80 percent of sunlight. “More reflective roofs and pavements make up a measure that pays itself many times over,” says Akbari, a board member of the Global Cool Cities Alliance, a group formed in 2010 to increase the reflectivity of cities across the globe. He and his colleagues have calculated that increasing the reflectivity of urban roofs and pavements from 15 percent to 25 percent would decrease the average global temperature by up to .07⁰ Celsius over the next 300 years, equivalent to about 150 billion tons of CO₂ emissions. They also discovered that reflective roofs could reduce a building’s net energy use by 10 percent to 20 percent, decreasing greenhouse gas emissions from power generators. “Energy efficiency in general is the best way to address global warming and climate change,” concludes Akbari, noting that cool surfaces can not only reduce the demand for air conditioning but also lower temperatures in cities, “cooling the globe as a whole” while improving air quality. No matter which strategy eventually gets the green light, engineers will play a key role in designing the technologies to deliver and assess it. Consider NASA’s powerful ICESat-2 observation satellite. Launched last September to precisely measure elevation changes in the Antarctica and Greenland ice sheets to 2 centimeters, it is returning huge volumes of data that also can help researchers accurately measure the height of land, rivers, lakes, and forests, the BBC reports. Its half-ton laser altimeter shoots green beams back down to Earth at a rate of 10,000 pulses every second, with bounce-back times equating to the height of the reflecting surface the light hits. The first ICESat pioneered the charting of sea-ice volumes in the Arctic between 2003 and 2009. Probes of geo-engineering’s practicality also are vital. A 2010 study of the ash spewed over the Pacific by the 2008 eruption of Mount Kasatochi in the Aleutian Islands, for example, cast doubt on the soundness of fertilizing oceans with iron to spur the growth of CO₂-absorbing plankton. Though the volcanic ash triggered a huge bloom, the plankton absorbed only about 37 billion kilograms of carbon dioxide—a tiny fraction of what fossil fuels release annually. New York-based freelance writer Charles Q. Choi is a frequent Prism contributor.